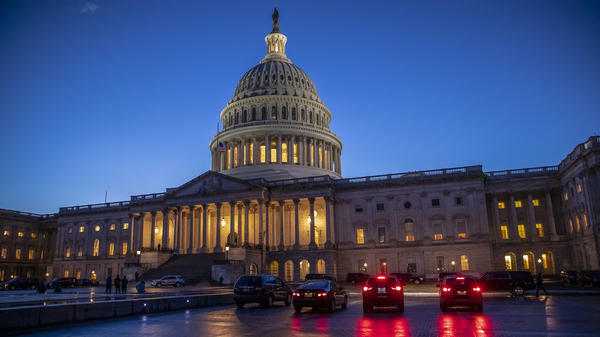 The U.S. Capitol is seen Friday as the Senate worked on a House-passed bill that would pay for President Trump's border wall. After a procedural vote in the Senate, both chambers of Congress adjourned until midday Saturday. Trump has demanded any funding bill include money for his border wall — his central campaign promise — and appears to be goading congressional Democrats into a fight after being egged on by his base and conservative commentators. While a version of the legislation that includes some $5.7 billion for a wall on the Southwest border passed in the House Thursday night, the Senate won't take up a spending measure until there is a deal that can pass all of Congress and that Trump has committed to supporting. Vice President Pence, along with budget director and incoming acting chief of staff Mick Mulvaney and White House senior adviser Jared Kushner, continues to negotiate with bipartisan congressional leaders on Capitol Hill Friday night. House Majority Whip Steve Scalise's office told lawmakers they would get a 24-hour notice before the next vote making it likely a partial shutdown would continue through at least part of the weekend. In addition, Monday and Tuesday of next week are already scheduled as federal holidays. Robert Wilkie, secretary of the Department of Veterans Affairs, issued a statement Friday night saying that "all VA operations will continue unimpeded" in the event of a partial shutdown because the VA "is fully funded for fiscal year 2019." "We thank the president and Congress for their commitment to our nation's heroes in funding VA, and stand ready to provide all of the VA benefits and services our Veterans have earned," Wilkie also said. Trump said earlier Friday the government could be shut down "for a very long time" unless the Senate approves a funding bill opposed by Democrats. In a series of morning tweets, Trump, who previously said he would "be proud" to shut down the government, attempted to shift the blame onto Democrats for a potential shutdown. "If Dems vote no, there will be a shutdown that will last for a very long time. People don't want Open Borders and Crime!" Trump tweeted. A procedural vote on the House bill narrowly passed in the Senate Friday evening — after being held open for more than five hours to allow senators returning to Washington to vote — with Pence presiding over the chamber to break a 47-47 tie. However, Senate Majority Leader Mitch McConnell, R-Ky., said there wouldn't be any more votes until an agreement between the White House and both Democratic and Republican congressional leaders is reached to keep the government open. Wavering Republicans who had been considering opposing the procedural vote — such as Sen. Bob Corker, R-Tenn., and Sen. Jeff Flake, R-Ariz., who had changed his "no" vote to a "yes" — underscored that their support was given in a good-faith effort to keep negotiations going ahead of the midnight deadline. "What this does I think is to push this ahead to a negotiation that yields a result and does the best we can to keep from shutting down government or if it does shut down, shutting down briefly," Corker said on the Senate floor Friday evening. Senate Democratic leader Chuck Schumer, D-N.Y., had told reporters Thursday night: "The bottom line is simple. The Trump temper tantrum will shut down the government, but it will not get him his wall." Schumer did meet Friday afternoon with Pence, Mulvaney and Kushner at their request. Schumer's office said he "reminded them that any proposal with funding for the wall will not pass the Senate" but that other proposals that "contain border security funding — without the wall ... could pass both chambers." Pence, Mulvaney and Kushner also met with House Speaker Paul Ryan, R-Wis., and some other House GOP lawmakers after their session with Schumer. Unless funding is approved by Congress and signed by the president, the nine federal departments and several independent agencies that were not part of an earlier spending deal will shut down 12:01 a.m. ET Saturday, leaving hundreds of thousands of federal workers without paychecks as Christmas approaches. Many employees who do what are considered essential duties, including law enforcement agents and Transportation Security Administration officers, would remain on the job. Trump also met with Senate Republicans earlier on Friday. Trump has urged McConnell to change Senate rules and allow a simple majority to pass the spending bill, rather than 60 votes, a major disruption to Senate protocol known as the "nuclear option." When they held the majority, Democrats changed the rules to allow a majority to vote for nominations, but not legislation, and McConnell has opposed going further, with the knowledge that if Democrats regain the majority, it could be used against Republicans. After the president's tweet, a number of GOP senators said they would not be in favor of changing the rules. "We have rules to follow," said Sen. Lamar Alexander, R-Tenn. "I want to put a stop to this practice of the Senate breaking its rules to change its rules. I will not vote to turn the Senate into a rule-breaking institution and I hope that my colleagues will not." And a spokesman for McConnell put the final nail in the coffin with a statement that said, "The Leader has said for years that the votes are not there in the Conference to use the nuclear option. Just this morning, several Senators put out statements confirming their opposition, and confirming that there is not a majority in the conference to go down that road."